Meanwhile lets just say that we are proud Helon Hoffer contributed a whooping 29 entries. The Crystal Cascade Bridge as well as Bridge #3 are currently under construction. The Tucks Trail has two separate closures that must be navigated as you ascend to Hermit Lake. Rather than the normal start to the trail behind the AMC Trading Post, the trail begins up the Sherburne. The detours are well-signed and will add no distance to your hike. Pictures from Friday, March 23, in Tuckerman and Huntington Ravines. Join us this Saturday, March 17, at 5pm at International Mountain Equipment (IME) for the third installment in the White Mountain Avalanche Education Fund’s Continuing Education Series. Helon Hoffer will be reviewing fracture mechanics and exploring fracture arrest. Harvard Cabin will be temporarily closed mid-week due to a staffing shortage. The cabin will be open Friday and Saturday nights. This closure includes tenting outside the cabin. For those interested in overnighting in the Cutler River Drainage, you may do so at Hermit Lake Shelters. ESAW 2017: In the Books! Thanks to everyone who attended the 2017 Eastern Snow and Avalanche Workshop! We were very pleased with the whole weekend and it’s largely thanks to you all for coming and hanging out. Come to Allspeed Cyclery and Snow in Portland tonight at 6:30pm to show your support for MWAC! 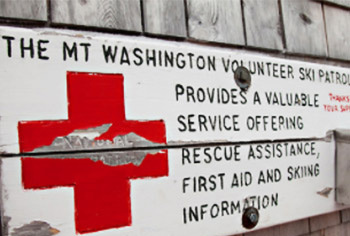 Frank will be giving on talk and terrain management and avalanche problems commonly found on Mount Washington. This will be a great opportunity to meet Frank in person and pick his brain about snow science and Lily the Avalanche Dog, especially what kind of sandwiches she prefers to eat. We’ll have lots of giveaways and refreshments. What better way to spend the evening watching the sleet come down than wishing it was snow with everyone else! Sarah Carpenter has spent most of her life on skis. She has been working in the field of snow and snow science since 1998, when she started as a ski patroller at Bridger Bowl in Bozeman, MT. Sarah has led mountaineering trips in the U.S., Chile, India, Africa and Nepal for numerous companies. 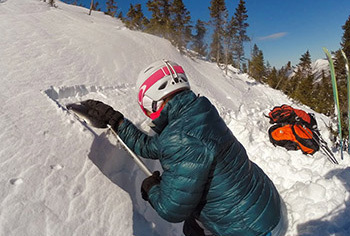 She teaches level 1, 2, and 3 avalanche courses throughout the west during the winter. She works a ski guide for the Jackson Hole Mountain Resort and Exum Mountain Guides in addition to being the co-owner of the American Avalanche Institute. I had the opportunity to ask Jerry a few questions about his work. I’m really looking forward to this Satruday and hearing his presentation: Organizing Doubt: Asking Questions in Avalanche Terrain. Have you registered for ESAW yet? Visit www.esaw.org and reserve your spot. The silent auction items are stacking up. This will be one day you won’t want to miss! Eric Knoff is one of our featured presenters at ESAW. He comes to us from the Gallatin National Forest Avlanche Center. We are very excited to have him join us on November 11 at Fryeburg Academy. Mark your calendars for the annual Eastern Snow and Avalanche Workshop that is taking place on Saturday, November 11, 2017. Registration for ESAW can be found at www.esaw.org. Proceeds from ESAW go toward the White Mountain Avalanche Education Fund, a non-profit designed to educate as many people as possible before they go into the mountains. Just a taste of Huntington and Tuckerman Ravine this morning. Bluebird skies but no traffic made for a very peacful sunrise.